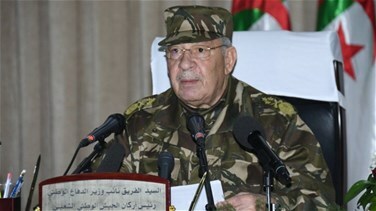 Algeria's army chief said on Tuesday the military was considering all options to resolve the country's political crisis and warned that "time is running out", after weeks of anti-government protests. Lieutenant-General Ahmed Gaed Salah's remarks were the strongest indication yet that the military, which has said it supports a transition period after the resignation of President Abdelaziz Bouteflika, is losing patience. In a speech broadcast on state television, Salah, who was speaking at a military base in the central town of Ouargla, urged protesters to avoid violence. "All options are open in the pursuit of overcoming the different difficulties and finding a solution to the crisis as soon as possible, in a way that serves our nations interests without regard to individual interests," he said. Salah did not specify what options the army would pursue. But he said: "We have no ambition but to protect our nation." Hours earlier, the chairman of Algeria's Constitutional Council, Tayib Belaiz, quit his post, state news agency APS said. That followed calls for his resignation by protesters who say he is part of a ruling elite they want abolished. Bouteflika stepped down on April 2 after weeks of mass protests demanding an end to his 20-year rule. But his departure failed to placate many Algerians who want to topple the old guard and its associates. Meanwhile thousands of demonstrators marched through the streets of Algiers and in cities across the country calling for political change in the eighth week of mass protests. These include Bensalah, who was appointed interim president after Salah declared Bouteflika unfit for office and said the military would back a transition period leading to a presidential election on July 4. Protesters are seeking radical change that would introduce sweeping political reforms in Algeria, an OPEC oil producer and major supplier of natural gas to Europe.